The 13th had a long and illustrious history but it was on the eve of what came to be known as the Zulu War that Montgomery joined their ranks as a Private with no. 267. Montgomery soon found himself in South Africa along with a phalanx of other troops from a number of regiments all rushed to Natal to counter what had become a very real Zulu threat. The regiment arrived at Table Bay, Cape Town on 5 January 1875 setting up camp on the Grand Parade where they were joined by a draft including 132 Privates arrived from England aboard the “Elizabeth Martin”. At this point the regiment was split into two Wings – the Right Half, which included the Headquarters, under Lt. Colonel Montgomery (no relation to William from what can be ascertained), was made up of, among others, 384 Privates who embarked aboard HMS “Simoon” and sailed for Durban on 15 January disembarking on 25 January 1875 whereupon they marched for Pietermaritzburg taking up station at Fort Napier. It was to this Wing that Montgomery was attached and which we concern ourselves with. By December of the 1876 the Transvaal Republic, the Boer state to the north of Natal, was facing financial ruin. The decision was thus taken by the British authorities represented by Sir Theophilus Shepstone to annex the Transvaal to the British Crown. The 1/13th under Lt. Col. Montgomery was placed on alert to support Shepstone as and when required. The regiment was now regrouped at Fort Napier and moved further north to be nearer the border with the Transvaal, arriving in Newcastle on 28 March 1877. On 11 April 1877 orders were received from Shepstone to cross the border and march on Pretoria without delay but the 1/13th were unable to respond immediately owing to a shortage of transport. Eventually the regiment arrived in Pretoria on 4 May and by the end of the month had settled down to routine garrison duties in Pretoria and the country towns of Middelburg, Lydenburg, Standerton and Utrecht. But a problem of a different magnitude awaited them – prior to the annexation of the Transvaal the Boers had been constantly in dispute with the Zulus over their border with Natal and with a Bapedi Chief named Sekhukhune who lived in an arid mountainous region in north-east Transvaal. By April of 1878 Sekhukhune’s actions had become a source of embarrassment to the British Administration and a force consisting of 4 companies of the 1/13th and other elements, set out to destroy Sekhukhune’s stronghold. Initial attempts met with failure and the force withdrew. On 27 October 1878 the combined British and Colonial Force had a measure of success at the Action at Shobhiyane’s Kraal but again failed to depose the Bapedi Chief. Seven men of the 1/13th were wounded in this action. Soon after this operations were suspended in the north-east Transvaal and the 1/13th reformed and marched to Utrecht, near the border with Zululand where they joined Evelyn Wood’s No. 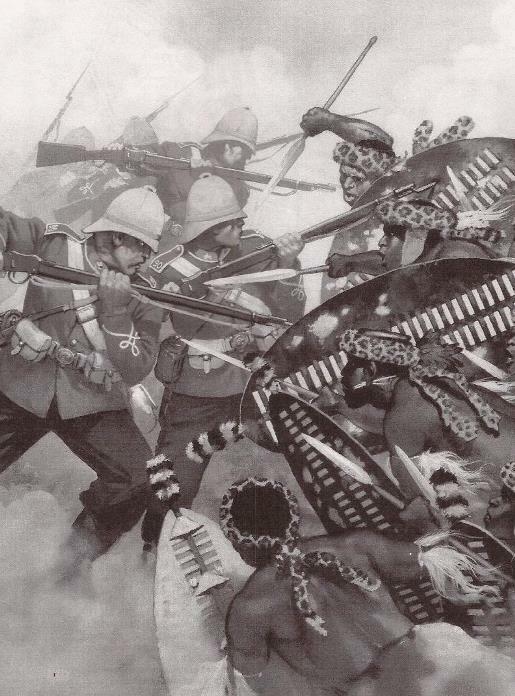 4 Column in readiness for what was to come – the Anglo Zulu War. On 11 January 1879 No. 4 Column crossed the Blood River into Zululand setting up base at Fort Tinta. Between the 22nd and the 24th they were involved in skirmishes with Zulus in the vicinity of Zungweni Heights which is where news reached them of the disaster that had befallen their comrades at Isandlwana. An attack, it was felt, was imminent and Fort Tinta was regarded as being too exposed necessitating a move to a stronger defensive position. Khambula Hill was thought to provide this. Neither the 1/13th nor their 90th regiment comrades were involved in the debacle that followed at Mount Hlobane on 28 March 1879 where there was a virtual rout of the British forces. No. 4 Column, totalling about 2000 troops, took up a defensive position at Khambula Hill where a Zulu attack on the following day was anticipated. At 1.30 p.m. on the 29th March a massive Zulu Army, estimated to be 20 000-strong attacked the British position and after a battle of some four hours, were defeated and retreated in disarray. The 1/13th distinguished themselves during the hard and at times desperate battle between British firepower and determined Zulu mass-attacks. The 1/13th held the southern flanks of the laager that had been created with elements defending the Redoubt and the Cattle Kraal. The company in the Cattle Kraal was overwhelmed and had to withdraw in the face of Zulu pressure but forays regained the advantage and the 1/13th was able to retake the Cattle Kraal and destroy the attack on the Laager. The Zulus finally broke and fled whereupon Colonel Wood released his mounted troops on the retreating Zulus wreaking havoc amongst the thoroughly disillusioned warriors. A total of 785 dead Zulus were recovered from the immediate area of the battle but it is estimated that at least 2000 died in the fight – many of that number among those who were mowed down as they fled. The 1/13th lost 6 men killed in action and 24 others wounded. “A British patrol, out early in the morning, brought in a Zulu defector with information that the camp was to be attacked at midday. The patrol reported that the Zulu Army could be seen approaching. The main fortification of the camp was the wagon lager, the wagons parked end to end in a square with additional fortification from heaps of turf, mealie bags and an entrenchment. The cattle were held in a square of wagons on a raised area of the plateau. In the centre of the camp area stood the earthwork redoubt built on a knoll. As soon as the Zulu approach was reported the troops assembled at their positions, 1,200 men of the 1st/13th Light Infantry and the 90th Regiment with 800 other irregular troops. Ammunition reserves were established along the rear of the lines. The Zulu formation paused for a time while final arrangements for the attack were made. It may be that the Zulu generals wished to avoid a direct assault on the British camp; Cetshwayo’s instructions being not to repeat the mistake of Rorke’s Drift but to threaten the Natal border and try to lure Wood’s force into the open. However the Zulu warriors were in no mood for caution. The Zulu Army began to move towards the British with increasing speed, the horns spreading out to the left and right flanks, the chest heading straight for the camp. The battle began at around 1.30pm. The left horn disappeared from view as it moved into the valley to the South, where it was held up by marshy ground. The right horn circled round to the North and came in towards the camp. Wood dispatched Buller with his mounted men to provoke the right horn into making a premature attack before the other sections of the Zulu Army were in place. Buller’s move had the effect intended, the mass of the right horn rushing towards the British fortifications. Buller’s troops rode back into the camp, several men having considerable difficulty getting away from the fast moving mass of Zulu warriors. Once the mounted men were clear the troops along the north face, the 90th Light Infantry, opened fire with the guns positioned in the open between the wagon laager and the redoubt. The storm of fire destroyed the right horn as a threat to the camp, the Zulu survivors rushing back to cover some 600 yards back and remaining there. Wood was free to deploy a significant number of the troops and guns from the north side against the chest and left horn as they came up. Hurried by the sound of firing, the left horn climbed the south face of the hill, out of sight of the British troops until they reached the crest, where they met a heavy fire from the 13th Regiment. The Zulus on the right of the advance were able to mount an attack on the cattle laager, forcing Wood to withdraw its garrison and leave the laager to the Zulus. The left horn and the chest attempted attacks on the camp at various points around the perimeter from the south to the north-east, all driven back by the heavy fire from the two infantry regiments and the guns of the Royal Artillery: the 2 mule guns in the redoubt and the 4 seven pounders deployed in the open ground between the wagon laager and the redoubt. At 5.30pm the Zulus began to fall back. Wood ordered companies of infantry forward to fire into the withdrawing Zulu regiments. Wood then unleashed Buller’s mounted men in pursuit of the increasingly disordered Zulu retreat. Enraged by the defeat of the previous day on Hlobane and the slaughter at Isandlwana the horsemen killed the fleeing Zulus mercilessly during the pursuit that continued over many miles. 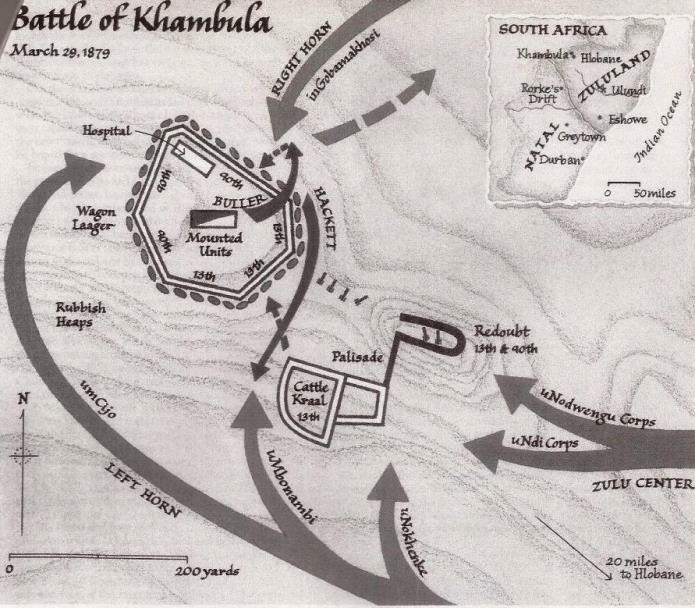 Khambula over and done with the British planned for a second invasion of Zululand. On 27 May 1879 the newly formed Second Division under General Newdigate commenced their drive towards Ulundi. Wood was tasked with commanding a reformed Flying Column leaving the Khambula area for the main thrust into Zululand. The 1/13th remained with him under the command of Major England. The Column was anything but a “Flying” one as it moved ponderously across Zululand reaching the White Mfolosi River on 1 July 1879. Cetshwayo was sent an ultimatum to which there was no response and at 6.40 a.m. on 4 July 1879 the Column crossed the river to do battle with what remained of the Zulu nation. The Column formed a square containing about 5 300 fighting troops and advanced across the Mahlabathini Plain to Ulundi. The eight companies of the 1/13th formed the right flank of the Square with the infantry advancing on “fours” and on halting, turning outwards to form two ranks in a kneeling position which presented an awesome firepower. They went into battle with the band playing and the Colours flying. At about 8.30 a.m. the Square halted as the Zulus appeared. The main attack came on the right of the Square where the 1/13th were positioned and, as the Zulus advanced, the massive and controlled firepower of the infantry was brought into play. The scale of loss was enormous with isolated pockets of Zulu coming within 30 to 40 yards of the Square before being decimated and driven back. By 9.20 it was all over and, once more, the Mounted Infantry were sent out to pursue and destroy the retreating hordes. The 1/13th suffered one Private Killed in Action with 15 others wounded. By 6 August 1879 the 1/13th had reached Fort Tenedos on the Tugela River having marched via Eshowe and Gingindlovu. They crossed the river into Natal the next day and had reached, by 13 August, the railhead Commissariat Depot before proceeding to Durban by rail, arriving on 15 August 1879. They then embarked aboard the “Euphrates” setting sail for home where, having disembarked they took up station at their barracks at Raglan. William Montgomery took his discharge from the regiment on 13 May 1882 after 7 years and 160 days service of which 5 years and 358 days counted towards pension. He was awarded the South African General Service (Zulu) War Medal with the 1878/79 clasp for his efforts. He appears to have remained in South Africa on the Army Reserve working his way down to the Cape Colony where, according to a Minute from the War Office dated 13 November 1883, “Private W.J. Montgomery, late 1st Battalion, 13th Foot, and now serving in the Cape Infantry” was mentioned in connection with the issue of his medal to him. The Cape Infantry were a short-lived but interesting unit - raised from imperial reserves in 1883 they were disbanded in 1886. Only a few colonials served in the ranks but almost all the officers had colonial service. The were raised for service in the Transkei with one Detachment at Kimberly. A large number of them went to the Cape Mounted Rifles when the Cape Infantry was disbanded. Quite a number of Afghanistan veterans were in the ranks actually having been recruited in London. Montgomery, the records show, enlisted with them on 5 June 1882 as a Private with ‘B’ Company, and was assigned no. 60. A trademark of this regiment was that almost half of them were in a spot of bother with the authorities at some time or another and he was no exception - He was reported to be in the cells between the 5th and 18th September 1884 and, when in ‘E’ (Kokstad) Company, was fined 2s 2d on 2 April 1885. On 29 June 1885 at Kokstad he was fined 7s 6d and again on 17 August 1885 an amount of 7s 6d. He was also confined in the cells between 17 and 30 August 1885. Montgomery took his discharge (By purchase £7) on 11 September 1885 (The War office was notified on 12.10.85.) His discharge papers described him as having a Fair Education, Fair Sobriety, Fair Zeal and Excellent Efficiency. Aged 28 years he was 5.9” in height with a fresh complexion, Brown Hair and Grey eyes. He held the South African War Medal and clasp according to the discharge book. The Kingston-on-Thames Board of Guardians have received the following letter, purporting to come from a private in the Cape Infantry Regiment, stationed at King William’sTown, South Africa. “Nov, 22, 1884 – Sirs – I am writing these few lines to you as I am in want of a young woman to make my wife, if you should know of any young woman aged about 22 to 34. My age is 30, and I shall be glad to know if I am allowed to have a young woman from the house. I will send my photograph immediately if required, and I should be glad to have one of the young woman. I have, thanks to Cam Simpson, been able to add to Montgomery's story with his Cape Infantry history. Little is known about this outfit which only existed for 4 years.